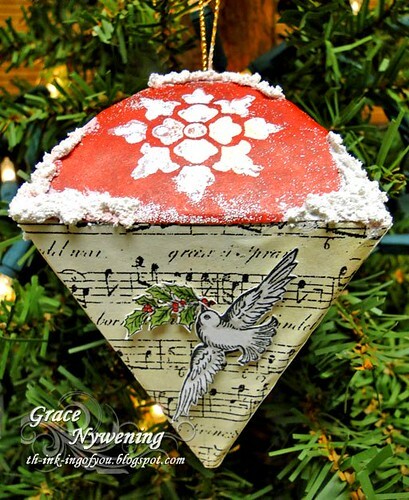 Th-INK-ing of You: LOC Ornament Blog Hop! The beginning of the blog hop is at the Layers of Color blog. If you came here from Gini Cagle's blog, you are in the right place! 5 drawings for a $20 Layers of Color Gift Certificate! First, let me share my ornaments with you! 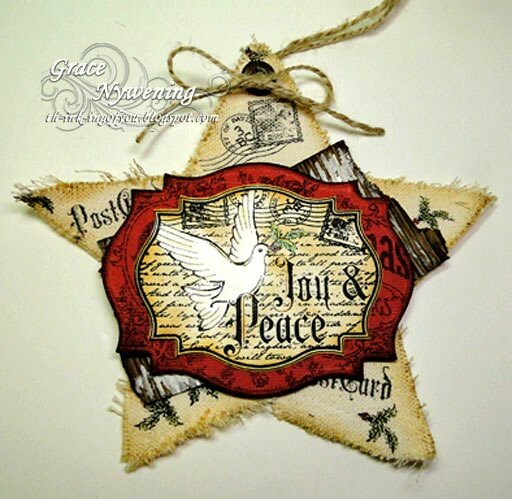 I used Layers of Color Christmas Blessings Clear Art Stamp Set for this ornament, stamping the postage mark from the "City of David", and other elements from the set directly on my linen sewn star with Stazon Ink, and lightly colored the holly with Copics. I used a recycled Starbucks corrugated wrapper that I dabbed on some white acrylic paint for my next layer, and then I stamped the image from Christmas Blessings onto Papertrey Vintage Cream and lightly colored with Prisma Pencils on the holly. I painted the dove with Shimmerz Angel's Wings. I used my Grand Calibur to cut the two largest Spellbinders Labels Eighteen out. My red layer is a scrap of Cordination that I stamped the largest image from this set on, and then sanded and sponged it. I added a big bronze grommet and some twine as a hanger. I love how this one came out! 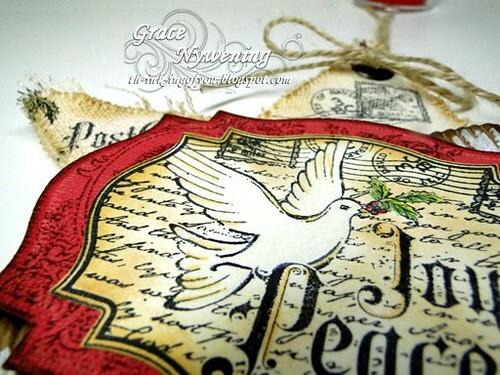 This was a super easy ornament, because I started with a chipboard ornament and just decorated it with designer paper. I used scraps of musical score for the bottome and some red Provocraft that I've had forever on the top. Then I stamped with white craft ink an element from LOC Touch of Elegance Clear Art Stamp Set that reminds me of a snowflake on each of the 4 sides. I heat embossed each one with white embossing powder, then I used my VersaMark Pen to add dots of white glittery embossing all around on the red. I hung the ornament on a hanger and applied Snow-Tex, which gives the dimension to the top. A little more glitter and the top was done. On the lower parts, I used LOC Royal Birds Clear Art Stamp Set which I cut out and added one sprig of holly to each from the Christmas Blessings Clear Art Stamp set. 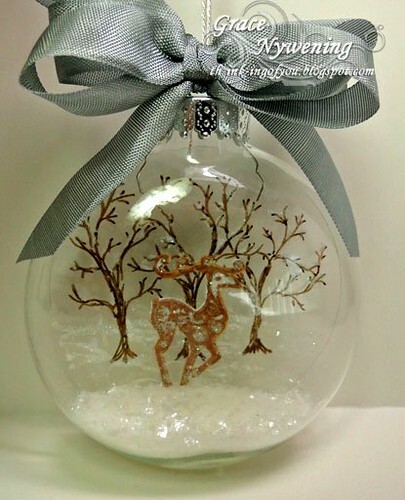 I did something a little different for this one and used my tried and true acrylic inside of glass ornament technique, but I first used Sharpies to hand draw some bare branch trees, and then used a white Sharpie Paint Pen to add snow to the tops of the branches and drew a few hills in the background. Then I stamped a reindeer from the LOC Reindeer Waltz set and heat embossed with glitter ep, and adhered. I punched a hole in the top of the acrylic circle I had cut, added thin silver thread to hang it by, and rolled it up to tuck inside. Once I had it where I wanted it I tied the thread to the topper. I also added some snow from Martha Stewart for the bottom of the ornament. A little smoky seam binding bow finishes it off. I hope you enjoyed my ornaments! on Layers of Color blog! My gift to you: Chances to win a $20 Layers of Color Gift Certificate! You and at least one friend “LIKE” Layers of Color Facebook page, then comment here on my blog that you did this. When your friends "LIKE" LOC, ask them to comment on LOC Facebook that you sent them. Refer more friends for more entries! Leave me a comment mentioning which friends participated. No limit on entries! Winner will be announced here tomorrow. There are still MORE GIFTS for YOU!